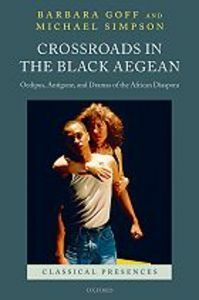 Crossroads in the Black Aegean is a compendious, timely, and fascinating study of African rewritings of Greek tragedy. It consists of detailed readings of six dramas and one epic poem, from different locations across the African diaspora. Barbara Goff and Michael Simpson ask why the plays of Sophocles' Theban Cycle figure so prominently among the tragedies adapted by dramatists of African descent, and how plays that dilate on the power of the past, in the inexorable curse of Oedipus and the regressive obsession of Antigone, can articulate the postcolonial moment. Capitalizing on classical reception studies, postcolonial studies, and comparative literature, Crossroads in the Black Aegean co-ordinates theory and theatre. It crucially investigates how the plays engage with the 'Western canon', and shows how they use their self-consciously literary status to assert, ironize, and challenge their own place, and that of the Greek originals, in relation to that tradition. Beyond these oedipal reflexes, the adaptations offer alternative African models of cultural transmission.